Have you wanted to try making ATC's but were afraid you weren't good enough? Not sure how to make an ATC? If so this swap is for you. This swap is for people new to making artist trading cards who want to do so in a non-judgmental swap. If you are an ATC "pro" who wouldn't be happy with a beginner card this swap is not for you. For this swap you will make one ATC card for two partners (you will get two ratings.) Standard ATC rules apply; card must be 2.5" X 3.5" (6.35 cm x 8.9cm) on sturdy background. Put the name of the card, date made, your name, on back of card. Card may be hand drawn, painted, stenciled, collaged, zentangled, embellished, use die cuts, done in fabric, etc. However you choose, except for "sticker slapping." Stickers may be used if they are done well, don't just stick one on a piece of card-stock and call it done. Newbies with a well filled out profile allowed. No unresolved, unexplained ones or threes in last 6 months (message me if you would like to explain a poor rating for consideration.) I will check all profiles prior to assigning partners and will ban questionable swappers. Making this international as postage shouldn't be much for a flat envelope. 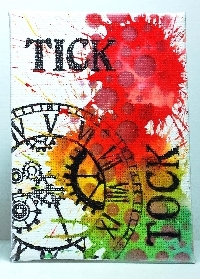 There are lots of YouTube videos and Pinterest ideas for making ATC's if you need instruction/inspiration. So your atc is senders choice? @Lolly yes it is senders choice, however you choose to make it. The only thing is to be aware that this may be someones very first time making an ATC and therefore may not be as accomplished at them as others may be. That's no problem, I'm looking forward to this swapp and thank you for hosting it. Your welcome Lolly, & thanks for joining in. TO ALL NEWBIES: please remember that you must have a well filled out profile in order to participate in this swap. I have messaged several of you and see that your profiles are still blank. Having a filled in profile helps others get to know your likes & dislikes better and is a requirement for many swaps here on Swap-bot. Thanks for your understanding. @ nursepat723: On the upper right of this page, there's this little box titled "Swap member options". The second entry is "see the partners you send to"; if you click there, a popup window with the addresses should appear. So What if one of your partners still haven't sent theirs? :-( This is my very first swap so I wasn't sure how it works.